(Nanowerk News) Scientists at the University of Glasgow have devised a molecular 'LEGO toolkit' which can be used to assemble a vast number of new and functional chemical compounds. Using molecules as building blocks they have been able to construct a molecular scaffold based on tiny (nano-scale) storage cubes. This new ‘designer route’ opens the door to many new compounds that, potentially, are able to act as the ion sensors, storage devices, and catalysts of the future. 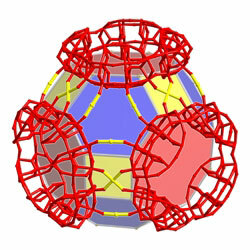 Researchers within the Department of Chemistry created hollow cube-based frameworks from polyoxometalates (POMs) – complex compounds made from metal and oxygen atoms – which stick together like LEGO bricks meaning a whole range of well-defined architectures can be developed with great ease ("Face-directed self-assembly of an electronically active Archimedean polyoxometalate architecture"). The researchers chose a ‘wheel-shaped’ polyoxometalate molecule, containing a 1-nanometre wide hole, which acts like a ‘window’ to the molecule. The cyclic compounds self-assemble in water to form beautiful cubic single crystals. The ‘windows’ of the ring-shaped building blocks lead to very large internal pores meaning that these new compounds can effectively act like storage boxes for ions and small molecules.A representation of the POM framework. Well-defined chemical architectures are essential for many functional materials; therefore very large POM frameworks could be used as ion fuel cells, batteries, sensors, catalysts and other new nanotechnologies. In the compound reported, manganese ions link the wheel-shaped molecules together into the molecular scaffold. Positively-charged potassium and lithium ions are also incorporated in the framework to balance the negative charge carried by the metal oxide ions in the POM wheel. The frameworks themselves can also be ‘tuned’ by changing the charge on the manganese ions.